Nearly 18,000 new species are discovered or identified each year. Some of those are named for celebrities, and others are given more colorful monikers. Some are big, and many are tiny, but all of them enrich our understanding of this planet we call home. Still, some are more exciting than others—at least according to the State University of New York (SUNY)’s College of Environmental Science and Forestry (ESF), which asked an international committee of scientists to choose the most notable species discovered in the past year. The ESF has just released its Top 10 New Species list, which includes a ruby-red seadragon, a new human relative, and a damselfly named for a Pink Floyd album. You would think that we’ve learned all there is to learn about the giant tortoises of the Galápagos Islands. You’d be wrong. Last year, genetic analysis of two tortoise populations on Isla Santa Cruz revealed that they were actually two different species: the established Chelonoidis porteri on the western half, and a new group, Chelonoidis donfaustoi. The latter, which comprises only about 250 tortoises, was named in honor of a park ranger and conservationist who called himself Don Fausto. Any carnivorous plant is worth a second look, but the giant sundew is extra cool. Growing up to 48 inches, this plant has earned its name. D. magnifica was first spotted by an amateur botanist atop the single mountain in Brazil where it grows. Reginaldo Vasconcelos took a snapshot of the plant and shared it on Facebook, where it was seen by plant researcher Paulo Gonella, who knew at once he was looking at a new species. The hominin family tree got a little bigger last year when the remains of at least 15 individuals were discovered in a deep cave in South Africa. They have a never-before-seen mix of features reminiscent of various ancient human relatives, including Australopithecus and other Homo species. H. naledi was approximately the size of a petite modern human, but it had a brain the size of an orange. Other features are just as confounding. Scientists are currently working to determine just how old the remains are. Isopods are armored, many-legged crustaceans. This group, which includes pill bugs, is large and diverse, yet the newly discovered I. iuiuensis does something no other isopod can: It builds little huts for itself out of mud where it can safely shed its exoskeleton. The tiny bug, less than half an inch long, was found at the bottom of a sinkhole. Ahhh, anglerfish. These mistresses of trickery and horror are, without a doubt, some of the weirdest creatures in the ocean, and that’s saying something. L. dinema has the unfortunate distinction of being discovered in the wake of the Deepwater Horizon oil spill during an assessment of damages to marine habitats. Like their cousins the seahorses, seadragons are long, bony fish with trumpet-like snoots. Only the third species of seadragon discovered, P. dewysea is about 10 inches long and makes its home in slightly deeper waters than its kin. This one’s something of a bait and switch: Scientists named this featherwing beetle after Paddington Bear in order to draw attention not to the beetles, but to the threatened Andean spectacled bear that inspired Paddington in the first place. The books tell of a bear that showed up in Paddington station with a sign reading “Please look after this bear.” The beetles themselves (remember them?) are eensy-weensy—just 1/25th of an inch long—and, like the bears, come from Peru. This species was identified from a single specimen, a female that traversed the forests of what is now Spain around 11.6 million years ago. The fruit trees in which she made her home are gone now, and have been replaced by a landfill, which is where her remains were found. The little ape’s nickname is a diminutive form of Eulàlia, a patron saint of Barcelona. We should never assume we’ve seen all there is to see. This flowering tree, completely new to science, was found just a few meters off the road in a national park in Gabon. Not only is this tree a new species, but it so differs from others that it was given its own genus, Sirdavidia, thereby entering the ranks of the many organisms named for Sir David Attenborough. 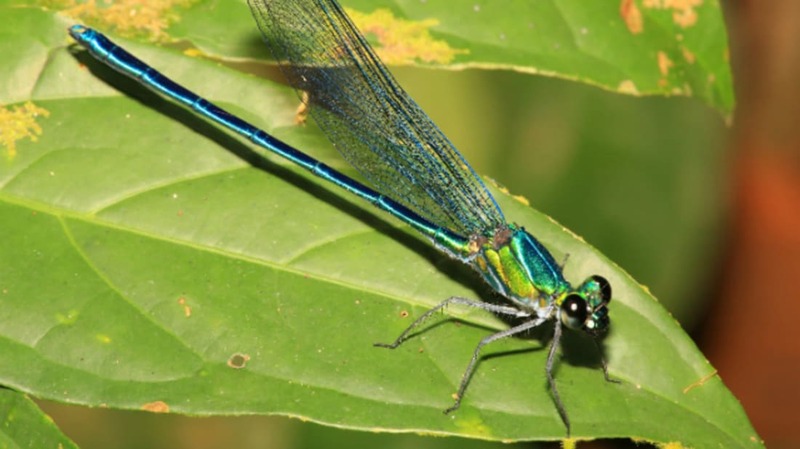 The number of known damselflies shot up last year, when a single publication described 60 new species, including the pretty sparklewings shown here. Scientists named this new member of the genus Umma after the Pink Floyd album Ummagumma.